How much more of it does she have to spend in quarantine, due to what Wagner Farm management has attributed to her being "picked on". Perhaps if Wagner Farm wasn't bringing so many pigs and lambs to Wagner Farm, there would be less pig injury issues. 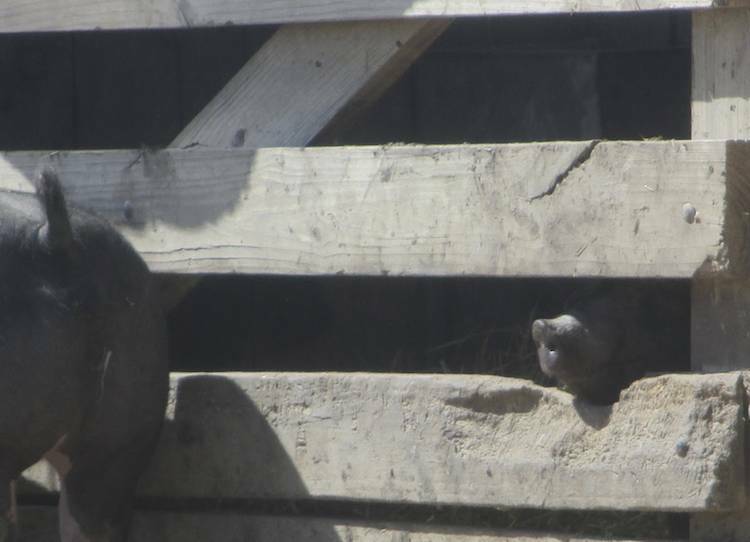 Pig still in quarantine from last week at the public funded Wagner Farm, Glenview, IL - how much longer? As Wagner Farm management has already confirmed that this pig, along with the other 13 pigs and 18 lambs there being exploited by Wagner Farm and their Glenview Clovers 4-H club, will be sold for slaughter this summer, this pig doesn't have much time to enjoy the rest of the short life she has left, due to Wagner Farm and their Glenview Clovers 4-H club's chosen program outcomes. How much more of it does she have to spend in quarantine, due to what Wagner Farm management has attributed to her being "picked on". Perhaps if Wagner Farm wasn't bringing so many pigs and lambs to Wagner Farm, there would be less pig injury issues. This is the second pig in barely more than two weeks who has been quarantined; the first pig being quarantined attributed to an "abrasion". Wagner Farm's Glenview Clovers 4-H programming has been wrought with numerous reports over the course of ongoing years of Glenview Clovers 4-H lambs and pigs being reported as injured, sick, or dead while still at Wagner Farm - before they can even be taken to auction to be sold for slaughter. Management from the public funded Wagner Farm, Glenview, IL has already confirmed to personnel from the nonprofit animal advocacy organization Wagner Farm Rescue Fund that the lambs and pigs at Wagner Farm (part of their 2017 Glenview Clovers 4-H project) are already scheduled to be sold to slaughter at the end of the program season - just like these animals' predecessors. Wagner Farm Rescue Fund is a 501(c)3 nonprofit organization founded to address numerous animal protection issues at the public funded Wagner Farm which is managed by the Glenview (IL) Park District. Wagner Farm Rescue Fund exposes the myths of "humane" locavore animal agriculture programming stemming from a public funded facility, including events, education, and children's programming resulting in sales to slaughter of project animals.